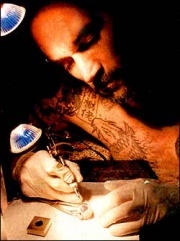 Corneal tattooing is not only possible, but it has been known and done now for over 2,000 years — it became almost commonplace in the late 19th century and into the 20th century to correct defects such as corneal scarring and leucomas. These days, it is done less often because contact lenses are very effective at covering these defects and prosthetic technology is also more accessible. However, not everyone can wear contact lenses and not everyone wants their eyeball popped out even if it is blind; hence cosmetic tattooing of the eye. There are a number of ways that the procedure can be done. The British Journal of Ophthalmology (2002) reports on what seems like the most primitive. It is done by hand, using a standard tri-bevel needle similar to what is used for body piercing and standard drawing inks (not tattoo inks — although it should be noted that the drawing inks chosen had over sixty years of successful history in this application) as a coloring agent. The needle is dipped into the ink and then poked at an angle (creating a long puncture) into the corneal stroma, rinsing the eye with saline periodically as it becomes obscured with ink. Surprisingly, this method was reported to work well in about 90% of patients (the remainder complaining about the ink not holding). During healing, there is a feeling of something stuck in your eye as well as some redness. Primary healing takes about a week, a similar time to a normal tattoo. Dr. Jeanette Carlisle, an ophthalmic surgeon in Durban, South Africa who had a patient with a grey eye since 1975, agreed, saying, "Tattooing of the cornea is covered in the text books, but not performed here successfully. A colleague of mine tried it once, importing ink at great cost and spending about four hours painstakingly applying it to a patient's eye, but it didn't work." Dr. Carlisle found herself driving by the tattoo studio of Dave Edwards and decided to stop and ask his advice. Over the next months, she brought him pig eyes to tattoo, which she then examined under a microscope to see where the ink was being deposited. Eventually, they were ready to try it on a human and obtained hospital permission to "operate." Five minutes later — that's all it took — and the patient's eye had been corrected, using a standard tattoo machine and procedure. It would be possible to tattoo the white of the eye, the sclera. I would not do it on a sighted eye because any time you tattoo the surface of tissue, you risk infection. On a fully sighted eye, it would not be worth the risk to do something like that. What about a custom contact lens to accomplish [this]? So, apologize if this article had gotten you all excited thinking you can get yourself some wings tattooed off your iris! This page was last modified on 8 March 2013, at 06:28. This page has been accessed 130,733 times.